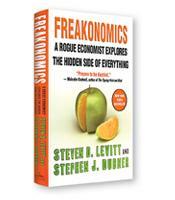 Freakonomics offers readers the hidden facts buried within the stories they live and see dramatized every day, along with the numbers and statistics that can help them draw sense from the chaos. By justifying the use of strange questions to get at the heart of the matter, the authors show how economists turn collections of facts into unusual theories and then prove them by applying critical analysis. NOTE: The online version of this title only contains the PDF and MP3 formats.